Your body is your brain. When it comes to feeling safe and well, it’s not all in your head. And if you don’t feel safe and well, you can’t think clearly about much of anything. So basically, your body is your brain. We could also say your body is your #1 brain, and that heavy organ in your skull is your #2 brain. The primitive brain primarily speaks one language, reports somatic expert Peter Levine, and that is the language of sensation. This means, all those fancy thoughts and ideas do not have much effect on the primitive brain. Why does this matter? It matters because our primitive brain is responsible for assessing our safety and wellbeing. If we don’t feel safe, our primitive brain assumes there is a threat in the vicinity, and a cascade of reactions occur in our body that keeps us from thinking about much of anything else. First, the body organizes itself to identify the threat: our muscles stiffen (sore necks or backs anyone, this may be related to chronic ‘startling’ in the body). Then, our fight/flight system gets revved up and ready for action, shutting down non-essentials like digestion and elimination (tension in the gut, loose stool? constipation? These can relate to an overactive stress response). Next, we scan about looking for threat (In this state our mind is fully engaged in ‘identifying’ threats, whether they are actually there or not. With defensive orienting, seek and ye shall find, is an accurate description). When this ‘all systems go’ reaction is happening, we move into a tunnel vision that seeks to find what it is looking for, damn it! and protect ourselves from it. This mentality results in many misidentifications of threat as well as misplaced self-protection reactions (angry outbursts, defensiveness, hopelessness, collapse, anxiety, depression). So what can we do about it? How can we use our body-brain to help us from falling into the rabbit hole? We cannot talk ourselves out of it, or think ourselves out of it, this is because the primitive brain speaks primarily the language of sensation. We need to sense our way out of it. I thank my lucky stars every day that I found a somatic counselor to work with when I was going through my own ongoing misidentification of threat (aka ongoing anxiety). In fact, I felt so sure about a somatic approach to wellness that I trained and became a somatic counselor myself. A somatic counselor helps you reassemble a felt sense of safety and ease, one that your body may have forgotten. 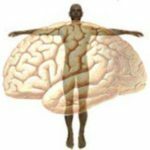 Through somatic awareness (body-brain), structures in the brain (head-brain) are repaired so that you can think clearly, maintain focus, feel safe, and be inspired once again. If you experience fear, spaciness, overwhelm, bursts of anger, or dread, you likely have some somatic repairing to do, and talking it through or thinking it over might not help much. Your body-brain needs to remember its own capacities for self-regulation, and that is not a heady job.